Revisions of March and April numbers show much slower pace of job creation than originally reported. The economy added 69,000 jobs in May—short of the 90,000 jobs needed to maintain pace with growth in the labor force. With downward revisions to previous months' payroll survey numbers, employment in May was only 20,000 above the previously reported estimate for April. As expected, the household survey showed general increases in unemployment after last month's large fall in labor force participation. Since January, the rate of unemployment has fallen from 8.3 to 8.2 percent while the employment-to-population ratio (EPOP) has ticked up 0.1 percentage points to 58.6 percent. Though the EPOP is nearly at its highest level since September of 2009, it was 63.0 percent five years ago. Overall, this month's report is disappointing, though not surprising. With the warm winter advancing employment growth earlier in the year, payroll numbers were bound to be low, while the return to growth in labor force participation arrested the fall in the unemployment rate. Even so, unless the economy picks up, producing jobs at a much higher rate, it is difficult to see how unemployment will be anything but persistent for some time. 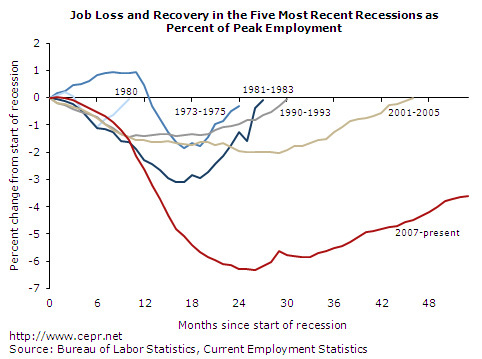 As it currently stands, the economy is still recovering at a slower pace than after the previous four recessions.